Chess Kenya has selected 12 juniors to take part in the 2015 African Youth Chess Championships (AYCC) in Lusaka, Zambia from December 5-13. 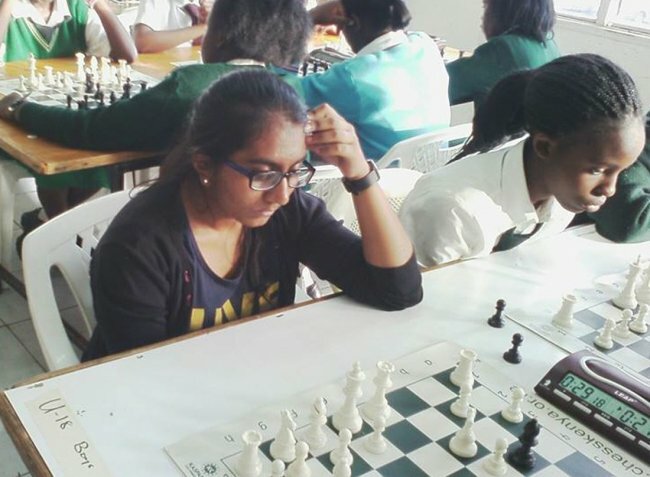 The 12, six girls and six boys, were picked over the weekend during the Kenya National Youth Chess Championships held at Makini School, Nairobi. They earned their places after automatically topping in the respective age categories where a total of 132 students from different schools across the country who participated in the national regional qualifiers faced off. 'In the boys competition, Sanjay Ramesh from Oshwal Academy won in the under-8 with a score of 5/5, Aguda Lwanga of Consolata School won in the under-10 with 7/7, Timothy Mwabu of Makini School was victorious in the under-12 with 5/5, Dev Shah from Kenton College won in the under-14 scoring 7/7, Brian Chege of St. Mary’s Boys won in the under-16 with 7/7 while Milton Mwangi from St. Mary’s Boys won in the under-18 scoring 6/7. Joy Njeri of Elimu School led winners in the girl's competition taking home the under-8 title with a score of 5.5/6. In the under-10, Hirandani Jia Rajesh from Oshwal Academy won with 4/4, Gilliane Titi of Makini School won the under-12 with 5/6, Varsani Reanna Paras of Braeburn School conquered in the under-14 with a score of 6.5/7, Riya Shah from Aga Khan Academy won the under-16 after scoring 7/7 with the under-18 title going to Karania Saloni from Oshwal Academy with a perfect score of 7/7. Winners in each age category were crowned Kenya National Youth Chess champions for 2015/2016 and received a trophy each. The first and second runners-up were awarded with silver and bronze medals respectively. Chess Kenya chairman Githinji Hinga has confirmed that the players will be fully engaged in different competitions in the run-up to the continental championship. The federation hopes to secure funding from the government to aid in the team's preparations. “We hope to secure funding and plan to have the team in camp one week before departure,” Hinga said. The key event will be a Bungoma Open on November 21-23 supported by the local county government. Four top players, three males and one female, will be sponsored to take part in the Tanzanian Chess Open in Dar es Salaam courtesy of the Kasparov Foundation. Under-8 Girls: 1. Joy Njeri (5.5/6, Elimu School), 2. Muturi Elane (4/6, Makini School), 3. Laurecia Minage (2.5/6, Queen of Angels Academy, Turbo); Under-8 Boys: 1. Sanjay Ramesh (5/5, Oshwal Academy), 2. Reeyan Gosrani (4/5, Peponi Prep School), 3. Odongo Lwanga (3/5, Consolata School); Under-10 Girls: 1. Hirandani Jia Rajesh (4/4, Oshwal Academy), 2. Ajiambo Ajia (2/4, Makini School), 3. Naiya Gosrani (2/4, Peponi Prep School); Under-10 Boys: 1. Aguda Lwanga (7/7, Consolata School), 2. Trevor Jakes (5/7, Fadhili Junior School), 3. Marsh Bhandary (4.5/7, Aga Khan Junior Academy); Under-12 Girls: 1. Gilliane Titi (5/6, Makini School), 2. Mercy Ingado (3.5/6, Elimu School), 3. Audrey Tracy (2.5/6, Shepherds Junior Academy); Under-12 Boys: 1. Timothy Mwabu (5/5, Makini School), 2. Darshan Shah (4/5, Oshwal Academy), 3. Mark Kogo (2/5, Makini School: Under-14 Girls: 1. Varsani Reanna Paras (6.5/7, Braeburn School), 2. Peris Waweru (6/7, Bishop Gatimu Ngandu Girls High School), 3. Sylvia Wahito (5.5/7, Bishop Gatimu Ngandu Girls High School); Under-14 Boys: 1. Dev Shah (7/7, Kenton College), 2. Hardiv Karania (6/7, Oshwal Academy), 3. Veer Shah (5/7, Oshwal Academy); Under-16 Boys: 1. Brian Chege (7/7, St. Mary’s Boys), 2. Ezekiel Mugambi (6/7, Alliance Boys), 3. Raphael Ndonga (5/7, St. Mary’s Boys); Under-16 Girls: 1. Riya Shah (7/7, Aga Khan Academy), 2. Doricus Wanjala (5/7, New Lights Academy), 3. Phyllis Wahura (5/7, Bishop Gatimu Ngandu Girls High School); Under 18 Girls: 1. Karania Saloni (7/7, Oshwal Academy), 2. Sonia Wairimu (5/7, Mugoiri Girls), 3. Esther Gathoni (4/7, Bishop Gatimu Ngandu Girls High School); Under 18 Boys: 1. Milton Mwangi (6/7, St. Mary’s Boys), 2. Simon Kanyutu (6/7, Baricho Boys), 3. Wanjiru Moses Maina (6/7).